Minnesota Vikings defensive end Jared Allen celebrates a sack against the Washington Redskins, one of seven sacks Allen has this season. 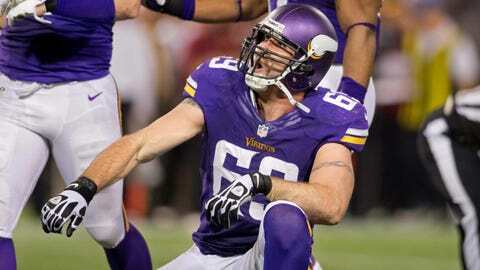 EDEN PRAIRIE, Minn. — Ask Jared Allen about sacks and you’ll often receive a passionate response from one of the best pass rushers to ever play in the NFL. Allen knows, in many ways, his career has been defined by his sack numbers, which are the most in the NFL since his rookie year in 2004. Allen, 31, remembers the moments quarterbacks have slipped through his grasp. When he lost a sack after getting poked in the eye a few years ago, Allen joked he finally discovered the one thing that would cause him to let go. And then there’s the good moments he can recall, such as a sack of Eli Manning this year when Allen reached completely around an offensive lineman to grab Manning and wouldn’t let go, trying everything he could to get Manning on the ground. Allen hopes eventually getting Manning to the ground in Week 7 will help continue his streak of double-digit sack seasons. The sack of Manning was one of seven this year for Allen, in the final year of his contract with the Minnesota Vikings. He has three games left to amass three more sacks and extend his current streak of six straight seasons with double-digit sacks. Since Allen led the league in sacks in 2005 with 15.5 in his final season with the Kansas City Chiefs, he’s been among the league leaders — including a league-high 22 in 2011 when he fell a half-sack shy of the single-season record. The only season in which he played all 16 games and didn’t reach double-digits was 2006. "Yeah, double-digits means the world to me," Allen said Thursday. "I think 10 is kind of what I put as my minimum. If you have 10, you can say that you had a good season. Sacks are so hard to get period. I like to view myself as a 10-sacks-a-year guy. I’ve got three games to get three so I’ve got to go out and do what I can do." Allen wants three more sacks, at least. And he laments the missed opportunities for him and Brian Robison, who is tied with Allen for the team lead with seven sacks. "Me and B-Rob were laughing about it today," Allen said. "The lead is 15 (Indianapolis’ Robert Mathis leads the league with 15.5 sacks). I said, ‘If we would take the ones that we had in our hands that we either missed or knocked the guy and the ball falls forward, which is an incomplete pass versus a sack/fumble, I think we both would be sitting right around 12 or 13.’"
Defensive coordinator Alan Williams wished he knew the reason Allen hasn’t finished off more sacks this season. "I don’t have an answer for that," Williams said. "If I did I’d gladly correct that. Sometimes they just come in bunches, and some years you have a boatload and some years it’s just not your year. The one thing that is, if we had been closing ballgames out, or a little bit better defense in being up, teams may have to come in pass more where he can just tee off in the pass rush. So that hasn’t necessarily been the case. The ballgames have been tight, so he’s playing run and pass and hasn’t been necessarily that case." Three more sacks would also help Allen leapfrog another big name on the career sack list, and he knows it. He showed reporters Thursday the list he keeps in his locker room, the list that shows Allen and his 124 career sacks are 2.5 sacks behind Hall of Famer Derrick Thomas for 13th place on the all-time list. Allen, who is second among active players in sacks behind 34-year-old John Abraham (133), is 14th on the list and 8.5 sacks away from Lawrence Taylor and Leslie O’Neal for 10th all-time. Kevin Greene (160 sacks) and O’Neal are the only two players eligible for the Hall of Fame with more sacks than Allen yet to be inducted. Hall of Famer Bruce Smith is still the all-time leader with 200 career sacks (note: sacks did not become an official NFL statistic until 1982). Opportunities to add to his total in Minnesota appear limited. Allen is third in team history in sacks with 81. But Allen is in the final year of the six-year, $73.3 million deal he signed in 2008 after being acquired in a pre-draft trade with Kansas City. Allen’s salary cap hit is over $17 million and it’s unlikely he’ll re-sign with Minnesota. But Allen isn’t ready to end his career yet, either. "When I stop having fun, I’ll hang it up," Allen said. "It’s something at the end of this year, I’ll pray about it. I’ll speak with my wife and go from there and figure it out. As long as I feel good and compete at a strong level and I feel like I can still help a team win and be an active role." Allen doesn’t want to hang on and add to his totals if it means he just becomes a situational pass-rusher as he ages. He said he plans on "having a monster year next year." "I’ll retire versus taking a step-down role and being a rotate guy," Allen said. "That’s for the birds. As long as I feel I can still get it done, I’ll do it. I’m my own harshest critic, so I watch film and I do my end-of-the-year assessments and I’ll work on what I need to work on. I’ll get with my trainers and come back ready to go. As long as I’m having fun …"